If you're a Flickr user, there are a multitude of tools and gadgets just waiting to entice you. If you're also a blogger, you're in luck, because several of them were created just for you. Here are three widgets that allow you to create slideshow galleries of chosen Flickr photos in a flash (no plun intended) and place them on your blog. 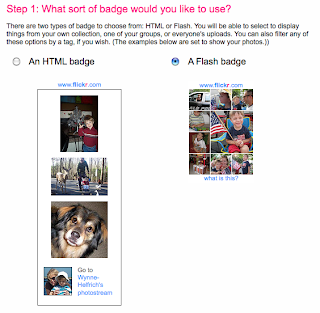 Then choose whether you want to use all of your photos or just those with a certain tag. Going forward you could even tag photos you want to show up on your blog with a special tag, like "blog" so they'd show up automatically. After that, you'll choose background, text, links and border colors. One more click gets you to the code you need to paste on your sidebar. Pictobrowser has a very smooth interface. It's really easy to customize the width and height of the widget. Pictobrowser spits out html, so placing your widget on a Blogger sidebar is no problem. Note: There's is a minimum width of 190 px., and if you make the widget small, you may get some strange cropping, as you can see below. This would be a great widget for a footer or very wide sidebar or column.